I was watching HSN and Jay Manuel Beauty caught my attention after seeing how their products perform on some of their models. I decided to buy them and put them to the test. Below is a full description and my thoughts about them. 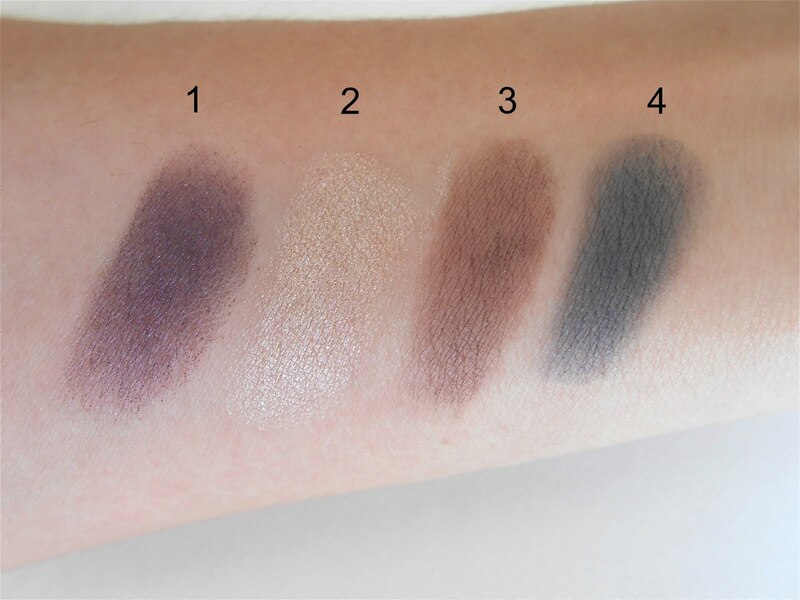 Luxurious quartet of eyeshadows expertly coordinated to create looks as unique as the women who wear them. Intensely pigmented color in perfect finishes create distinctive looks. When I saw the combination of colors included in this palette I can see myself creating day and night time looks with it. This eyeshadow quad has 2 shimmers, 1 satin and 1 matte shades. All of the colors work great together. The colors are very pigmented. Each eyeshadow has a silky, smooth formula and they blend super easy with very little fall out. The package is very sturdy and well made and it feels expensive. I like that it is travel friendly and includes a good size mirror to use on the go. Overall, I am very happy with my choice. On the HSN site they have 3 different quads but if you go directly to the Jay Manuel site, they have 11 different options. Each quad contains .05 oz and costs $24. 1) Purple shimmery with a dark charcoal base. 2) Cream gold shimmery. 3) Matte dark coppery/brown. 4) Satin dark navy blue. I used the 3 darkest shades on the outer corner of my eyes for intensity and the lightest shade on the lid, inner corner on the eyes, and on the brow bone for brightening out the look. On the lower lash line I use brown shade. This foundation is that it is a multi-functional silicone based liquid makeup enriched with micronized silk and plant based antioxidants. Like a second skin filtered veil, it creates an optical illusion of perfection. Hydrates, primes and evens skin tone and texture in one step, while camouflaging imperfections for flawless finish. Medium full buildable coverage. Does not settle into fine lines and pores. This is a thick medium coverage foundation that dries to a matte powder finish. The consistency is very creamy and glides on easily. I have combination skin, T zone oily and some dry areas around my mouth and cheek area. This foundation settled into my fine lines, pores, dry patches, and overly dried skin. It also doesn't provide a natural finish, it looks cakey on me. I really wanted to make it work so I used it with and without primer. I also used it with and without face powder but it just didn't work for me. When I used the primer it looked a little bit better but there wasn't much difference. I will say this foundation may work for people with oily skin because I noticed that in my T zone area it ended looking better than on the rest of my face. I do like the package since it is very unique. It is hard plastic but the clear part on the top is like a soft jelly/plastic that you squeeze to get the product out. Wear time I will say is about 6 to 8 hours. They have 12 different shades from light to deep complexions. Each tube contain 0.89 fl oz and costs $38.00. Jay Manuel is such one of the fantastic brand, I'm glad that you review it gun and good. Your eyes are beautiful complemented with those colors. I do need some new eye shadow. Finding quality product is always a great feeling. Looks like this worked pretty well. The Crave quad is soooo pretty with some of my favorite colors. I agree - you can create day and night looks from it. You created some very nice looks darling.